This Bank Holiday weekend just gone saw me preparing to run my first 10k since August last year. And when I say my first 10k, I don’t mean my first 10k race, I mean my first 10k period. In fact, my first run over 5k since August last year. So obviously I felt extremely well prepared for this. As ever I intended to do tons of training, but this time, just as I was getting into my running stride, I was struck down by 2 sprained ankles. So I was just happy to be able to run at all! The Island Run has been taking place since the 1970s and has previously been a 10 mile run. 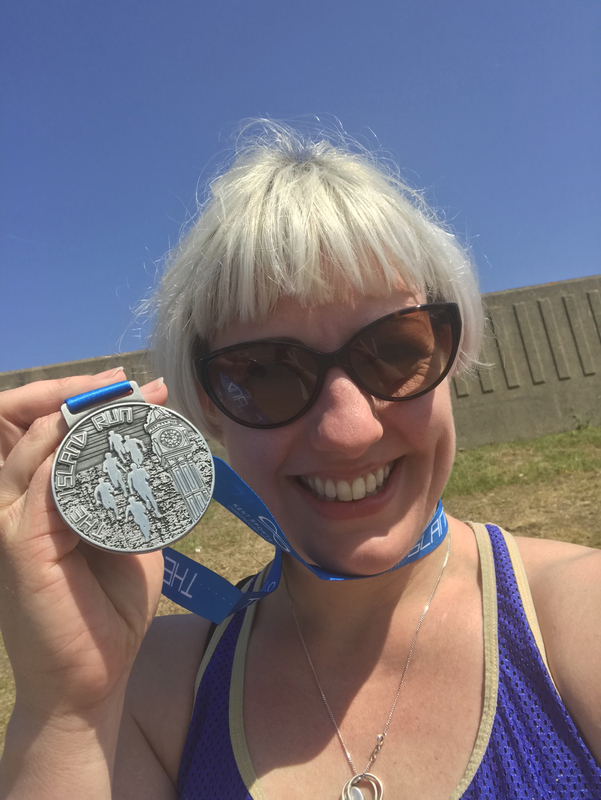 This year it was a 10k, which seemed like the perfect distance for me to head off and do with no training. And so, on a disturbingly warm May bank holiday morning, we arrived at the Beach in Sheerness to await the start. We nearly parked in Tesco, but it was a maximum of 3 hours parking and we were concerned we might be a little longer. So instead we drove around to a spot in a seafront carpark. This is a decision we soon regretted, as 10 minutes before the race was due to start an announcement over the tannoy warned people that there were traffic wardens ticketing anyone who hadn’t paid in the car park. This astonished us, as we hadn’t noticed any signs saying it was a pay and display, so we legged it back to the car, only to find a ticket stuck to the window. To be honest, the decision to send a warden to the car park 10 minutes before the race started seems a little mercenary, as I was advised by race organisers that they had asked for parking charges to be suspended that day and were refused. 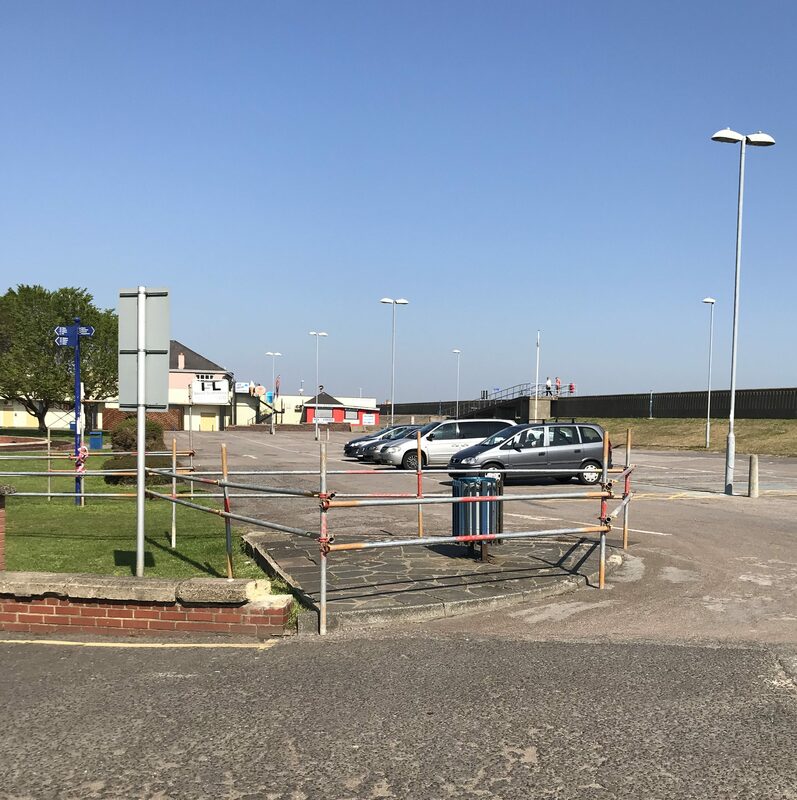 We will be appealing, because the only sign stating this was a pay and display is at the entrance to the car park, facing IN to the car park, and the pedestrian exit is in a different direction. But anyway, back to the race. There were 400 runners signed up for the race, which meant that we crossed the start line and the chip timing mats in mere seconds. The first half mile or so was a little slow as the route heads out, turns around and immediately heads back on itself in a short distance. This means that runners are coming from 2 directions in a big squish along the promenade, but with 400 runners it didn’t take long to spread out a little. 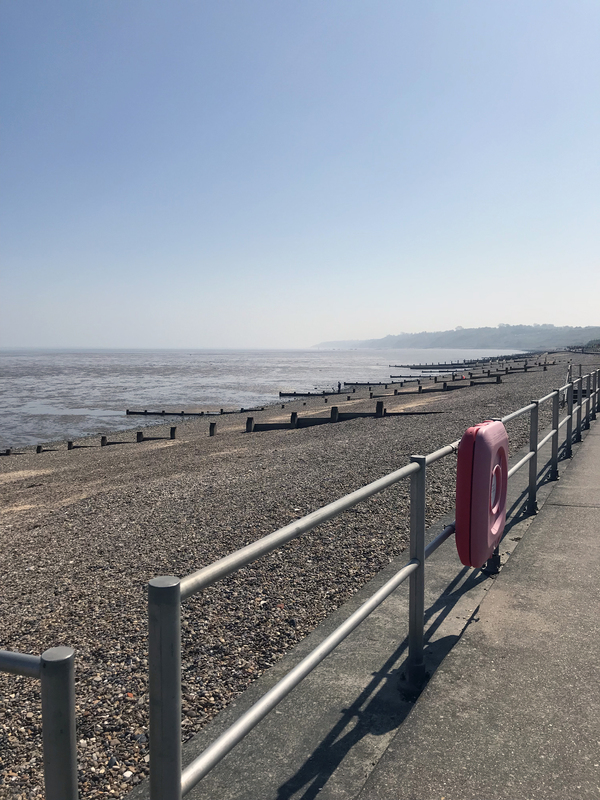 The route is an out and back route along a beautiful flat wide seafront promenade. There are a couple of spots where it heads off and onto road briefly, but mostly it’s gorgeous sea views, wide and flat the whole way. The atmosphere amongst the runners was great. People were friendly, but not too chatty (I can’t chat and run!) 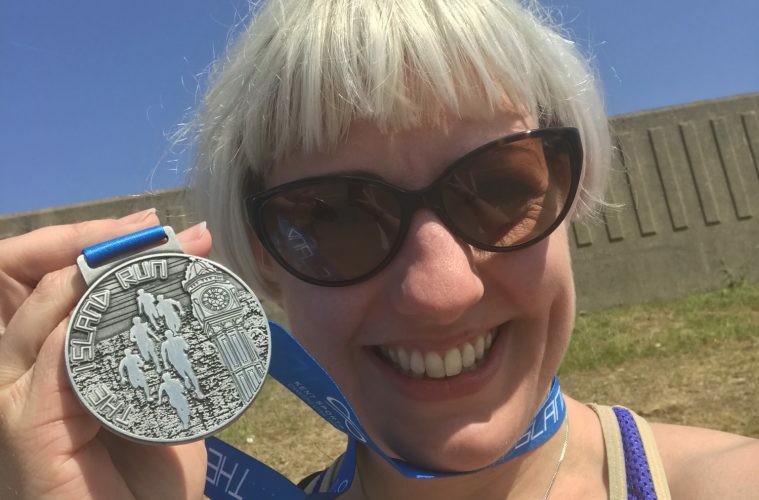 and it was amazing to run along the gorgeous seafront in beautiful sunshine! A quick glance at my watch told me that I was going pretty slow. I made it over 10:30 minute miles, but having not run further than 5k for so long I didn’t want to go too fast and burn out. Given this, I was rather surprised to hit the 5k marker and look at my watch to see a time of 29:40. This would be a pretty good pace for me, and I couldn’t quite work out whether my watch was off and the nice flat route had me making cracking time, or if the markers were off. There being nothing I could do about it, I grabbed a water bottle, promptly squeezed it too hard and kept running, coughing and spluttering water everywhere. I finished the run in 1 hour 1 minute and 15 seconds. Which is not too shabby with no training at all. But sadly I was to find out my suspicions were correct, and that the a marshall had been out of position at the start, meaning the run was actually only 9.5k. I picked up my medal and a bottle of Lucozade and settled down to watch the other runners come in. For a small race (and distance problems aside) the Island Run 10k was well organised and had a lovely atmosphere. It seems that the organisers of the race are learning and growing each year. 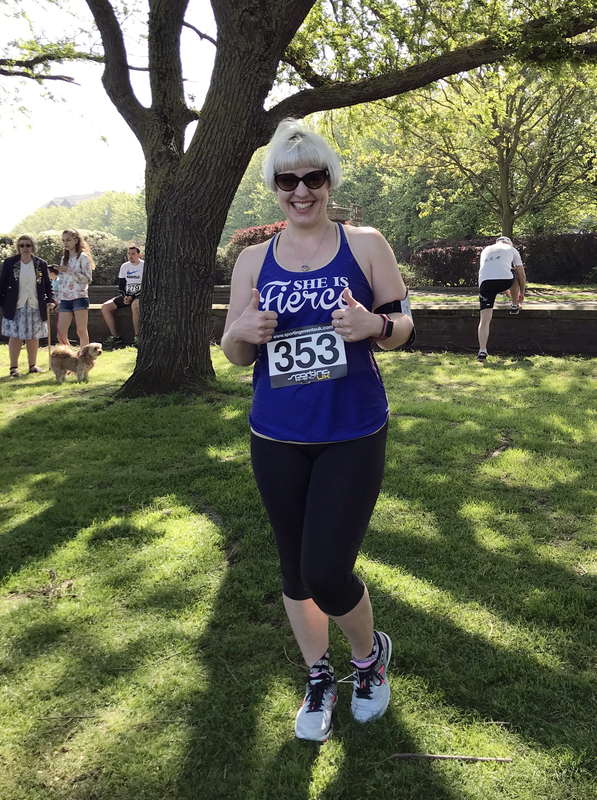 The race atmosphere was lovely, if I had any complaints it would be that it would be nice to have a little more interaction from some of the marshalls, being cheered on when you’re running alone really picks you up! I also felt the lack of goodie bags at the finish, they were mentioned on the website, but I believe they’d all gone by the time I finished, which is a shame, I do like my free race bananas! I grew up on the Isle of Sheppey where the run is held, and my family still live there, so heading back to take part in a run like this feels really special. I’m really looking forward to taking part again next year. Will I train properly for it? Who can say? You can find out more about the Island Run on their website. Aww how lovely! Well done on completing it!